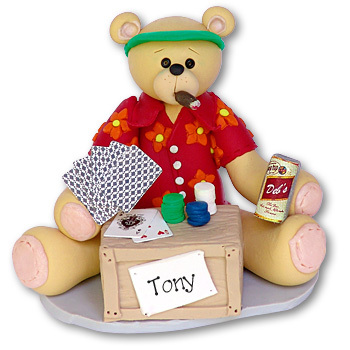 This Belly Bear Card Player has everything he needs, card, chips, cigar and beer! He may be easily personalized with a name or message on the box along with the year. A perfect gift for any guy that loves a good game of cards. The ornament is handmade from polymer clay, designed by Debi Allison and comes complete with hook and satin ribbon for hanging.